Which sampling method to use? Random Sampling? Systematic Sampling (Transects)? This is used where the habitat being sampled is fairly uniform. To remove observer bias in the selection of samples. Where statistical tests are to be used which require randomly collected data. Where a large area needs to be covered quickly. If time is very limited. To show zonation of species along some environmental gradient. e.g. across the Centre's heathland strips. To sample linear habitats, e.g. a roadside verge. Where physical conditions demand it, e.g. sampling a vertical rock face, using a rope to climb it. Systematic Sampling - Line or Belt? Where time is limited. A line transect can be carried out much quicker than a belt transect. To visually illustrate how species change along the line (a transect diagram). Keys can be chosen to represent individual species. Vegetation height can be drawn in choosing an appropriate scale. 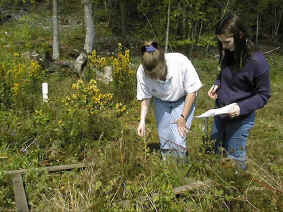 The slope of the line can also be measured when carrying out the transect and incorporated into the transect diagram. To show species ranges along the line. A belt transect will supply more data than a line transect. It will give data on the abundance of individual species at different points along the line, as well as on their range. What interval should be used? Transects can either be continuous with the whole length of the line being sampled, or samples can be taken at particular points along the line. For example, every metre, or every other metre. For both line and belt transects, the interval at which samples are taken will depend on the individual habitat, as well as on the time and effort which can be allocated to the survey. Too small an interval can make the sampling extraordinarily time consuming, as well as yielding more data than is needed. This can cause problems with presenting the data (line transects) as well as sometimes making it harder to see patterns of zonation because of too much 'clutter'. The ideal interval will be chosen by balancing the complexity of the individual habitat with the purpose of the survey and the resources available to carry it out.